Outdoor Sports in South of France, Whitewater rafting at St Martin Lys in the Aude river between Axat and Quillan at only One hour driving from Carcassonne. Gorges walking and Canyoning in the french Pyrenees at the famous Galamus Gorges near Perpignan, or the Canyon du Llech,that is the best Canyoning in France. All instructors working with Active Adventure are highly qualified and speak English. Outdoor activities in south of France near Perpignan and Carcassonne in the french pyrenees. Active adventure introduces you to the whitewater sports and mountain sports in the Pyrénées Orientales and Aude. 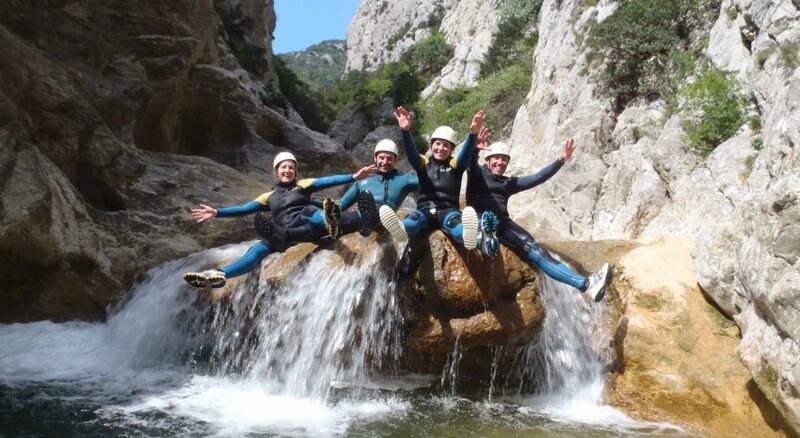 Rafting and Hydrospeed in the gorges de l' Aude, canyoning in the gorges du Llech on Canigou mountain and Aquatic hiking in the gorges of Galamus. Dominic White is your contact he will be happy to assist you. Open 7 day's on 7 from 9:00 am to 5 pm. you must make a reservation before coming.